Paperback, Revised edn. SIGNED. 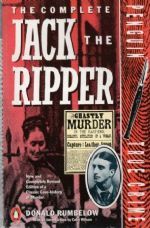 A new and completely revised edition of a classic case-history, with the theories, facts and conclusions of the Whitechapel murders. Illus., Addendum, Bibliog. and Index. 310pp. trade size softcover. 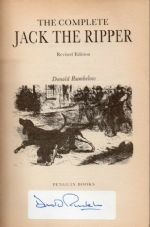 Donald Rumbelow was a contributor to the Grey House Books publication 'Who Was Jack the Ripper? A collection of Present-Day Theories and Observations'. With tipped-in label SIGNED BY DONALD RUMBELOW. With the usual lightly browned pp. o/w Vg+ with no creasing to covers.